Potato galettes, served with quail eggs. 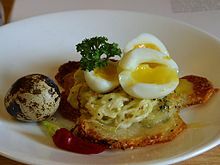 Quail eggs are considered a delicacy in many parts of the world, including Asia, Europe, and North America. 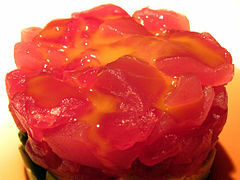 In Japanese cuisine, they are sometimes used raw or cooked as tamago in sushi and often found in bento lunches. In some other countries, quail eggs are considered less exotic. 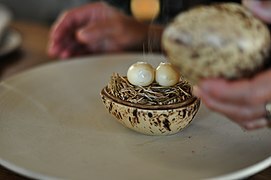 In Brazil, Colombia, Ecuador and Venezuela, a single hard-boiled quail egg is a common topping on hot dogs and hamburgers, often fixed into place with a toothpick. 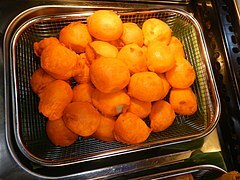 In the Philippines, kwek-kwek is a popular street food delicacy, which consists of soft-boiled quail eggs dipped in orange-colored batter before being skewered and deep-fried. 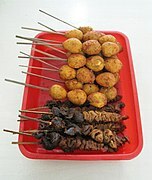 In Indonesia, small packages of hardboiled quail eggs are sold by street vendors as snacks, and skewered quail eggs are sold as satay to accompany main dishes such as soto and bubur ayam. In Vietnam, bags of boiled quail eggs are sold on street stalls as inexpensive beer snacks. In South Korea, large inexpensive bags of boiled quail eggs are sold in grocery stores. ^ "Eat Cheap, Top 7 Street Foods Around the World". Backpacker Ben (travel blog). August 2010. Archived from the original on 2015-10-29. This page was last edited on 20 April 2019, at 18:35 (UTC).